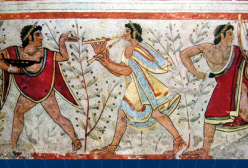 As well as occupying an area of rich farmland and excellent metal ores,the Etruscans linked the trade corridors from central Europe to the eastern Mediterranean. The Romans 'wrote them out' and never acknowledged just how much of their 'Roman' culture was, actually, invented by the Etruscans. As the people of central Italy grew wealthy on trade, craftsmanship and farming, they went all out for the best fashions of the day - which were Greek. But they didn't copy slavishly. They added their own twist that reflected different values to those of the Greeks. Etruscan women, for example, were free citizens in their own right - unheard of in ancient Greece. The Etruscans developed their own script, but it is still less than perfectly understood.